Last Thursday Shane and I drove out to the Forest to chill out and find new trails. We came across the Shawnee State Forest Horse Camp while out there. It is on Forest Road #4, right by Bear Creek Lake. The name of the pond inspired us to go check out this area and this could have been the biggest find ever for me! We drove around the area and there were many trucks with horse trailers on the back, and many horses with people walking around. We saw a few different bridle trails, ones that were actually single-track (wide enough for a horse). Today, Corey, Shane, and I headed out there to run. The trails proved to be too muddy to run on due to all the rain and horse usage, the trail was a mess! So, we decided to run up Forest Road #6, and it was hilly! There were three huge hills to climb, so that means six total since we went out and back. Our legs were heavy due to the workout yesterday, which I will address later, but we still ran at a nice pace, even came back a minute and a half quicker. While runner out this gravel road, I was amazed! I saw at least 5 different trail heads off to the side! There could have been more but I can't remember all of them. This was the trail heaven of the Forest! This made me really happy and I can not wait to hit these up. Seems like very well maintained since a lot of horses travel these. Also, some trails looked to be hilly and some flat, so there is some diversity. This is all on the North side of 125. There is still even more ground to cover on the South side of 125. For now, I am overwhelmed at the amount of trails I need to explore. I need to study the map and see some nice routes to take. I love maps, they are fun to look at and study. I was very, very pleased with this. Especially on the 400's where I felt like I could pick up the velocity at any moment I decided too. After getting into a few, I wanted to keep lowering my time and I finished really strong. Than the last mile, I ran very strong on the slick mud (first mile of course, the opposite way). My legs felt great yesterday but today they were super heavy on the run. It was a good feeling, I can tell I was doing work. All we have Friday is our 2 mile time trial. I feel a nice PR and would like to run 9:30 or under. I ran 9:35 earlier this season and that was with 3 mile reps to follow. The best is yet to come this season, I can't wait. The rankings came out today and we stayed the same, ranked #6. Aquinas who beat us by one point moved from 7th to 3rd. Nice to know we only lost to the 3rd ranked team by one point. Also, Malone isn't ranked 1st for the first time in 29 consecutive weeks, Southern Oregon passed them. This past weekend we traveled to Grand Rapids for our showdown at the Great Lakes Challenge. This meet showcases a lot of ranked NAIA schools from this area of the States. We were ranked the highest at 6th, Aquinas was 7th, Olivet Nazarene was 9th, and Cornerstone was 13th; plus there were other teams like Cedarville, Indiana Wesleyan, and Indiana Tech that have had good teams in the past, that could mix it up with the top guys. Last year this was also a big race with a lot of ranked teams running; we finished behind all those teams I just listed except Indiana Wesleyan, and Embry-Riddle, 7th place. This year Embry-Riddle went to a different meet but they are ranked 3rd in the Nation. This year we did not want that to happen again and knew we had a target on our backs since we were the highest ranked team in the race. It rained a lot in Michigan the days leading up to the race so again, the course was muddy. But, this plays in our favor because we are blue collar racers and are used to running in wet, muddy conditions. Although it did rain a lot, when we ran the course on Friday night, the course was in good shape. It was even in better shape Saturday when we raced, just a few puddles and a few slick spots. The race got out fast. I got boxed in at the start but somehow spotted a nice gap to my right and shot right up to the front of the race. I went from starting in a box on the left side of the start line to darting all the way to the right of the line. It defiantly was a good move, because from the gun, a few guys went out very hard. This was exactly what I wanted to do, get myself in the front of the race at the beginning and run with the top guys. At the mile I was in 7th place at 4:50. 4:50 is the fastest I have ever gone out in a race and I was amazed at how comfortable and relaxed I still was. 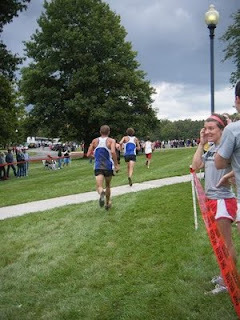 There were two Olivet guys ahead of me so I stayed right on their shoulder for as long as I could. During the seconds mile I was still within the second pack. Two guys were out front pretty far and seemed to be running away from the rest of the race. One of the guys, who eventually won, was from Cornerstone and the other guy was from Spring Arbor. I was glad that those two teams did not matter as much as Aquinas or Olivet. 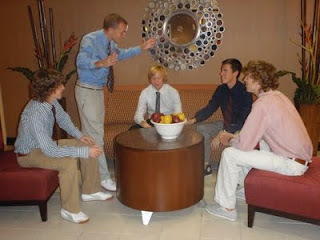 I kept contact with the Olivet guys as much as possible. At the two mile mark, my time was 10:03. 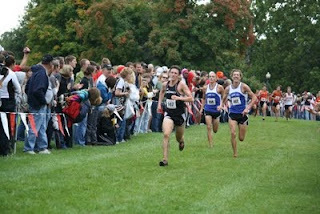 Soon after the two mile, 3 Aquinas guys came up on me and started to pass me. Luckily Corey was riding along with them. I kept right on them as long as possible but I got a few seconds backs back from them. At the 5k mark, it was 3 AQ guys and me and Corey all within a second from each other. This was becoming a race between two teams, Shawnee State vs. Aquinas; the race began to get very fast. My 5k time was 15:52. Soon after 5k, Corey about tripped and fell. It was almost disaster but he kept on his feet. His hand even touched the ground. He regrouped and continued with the AQ guys. During mile four I fell about 3 seconds behind Corey and the 3 guys from AQ but I kept telling myself to stay focused and to work myself back up there to give Corey some help. I never fell more than 3 seconds behind them, but I couldn't seem to get up there with them. The race was moving so fast at this point, it was hard to make any move or put in any surge. I began hearing people cheer for Linkous, so the race was still close with Aquinas and us but AQ had the apparent edge with 3 ahead of our 2. With a mile to go, it was still anyone's race. Linkous came by me with about 800 left and told me to go with him. I stuck with him and we started rolling. The two Olivet guys that were ahead of me earlier were still ahead of us but coming back. There were also other guys dropping off that had passed me earlier in the race. Coming around the last corner with 400 to go, it was Linkous, me, and the 3 AQ guys and Corey within 3 seconds of each other. One of the AQ guys started fading. Linkous and I passed him with no problem and kept our eyes up with the other 2. We passed one of the Olivet guys but the other one finished really well. Linkous finished really well and passed another kid from Sienna Heights, and even edged out Corey by less than .1 seconds. The other AQ guys finished hard and were ahead of us. 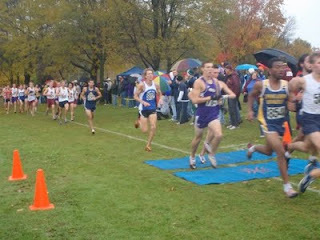 So, this is how it was, the first two Aquinas guys went 3rd and 5th. Linkous and Corey went 6th and 7th, and I finished 9th. The third AQ guy was 11th. The fourth AQ guy finished 15th, less than a second ahead of Galen at 16th. Our five man was Shane at 20th and AQ's 5 man was 23rd. It was so close and if you add it all up, the point total was Shawnee State 58....... Aquinas 57. One point was all it was, and it was not in our favor. It is a bad feeling to lose by one point but the race was so close and fair that I was happy about it. It was also a nice PR for me. 25:36 was my final time, Corey and Linkous ran 25:33. Out of our 15 guys that ran, 8 of us PR'd, so it was a great day overall. Getting beat by a team that is ranked only one spot lower than us is not too bad. It should be that close anyways, but it would have been nice for us to be one point ahead. Overall, the meet was awesome. The top 15 finishers received bags, so that was nice. They also provided pizza for everyone. This meet is one of the best ran meets around and I can't wait for a nice showdown next year! Now, we only have 4 more weeks left to the season. A week off, week of Conference, another week off, and the week of Nationals. Now, it is time to being everything together. The meets we have won and lost this whole season can be thrown away, because the two most important meets are coming up, Nationals being the most important. At heart, I am a Trail Runner. I know this is kind of duplicitous, because the majority of my runs are ran in Portsmouth, not on a trail. 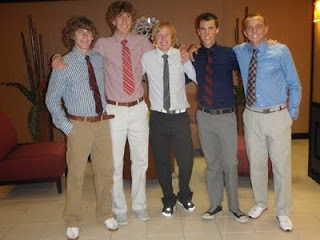 However, this is only because I am obligated to run in town since I run for Shawnee State and I have run with the team. This is fine, I have accepted it, it is my role on the team, and I have the rest of my life to run where I want to run! First and foremost at this current time, my focus is to improve Shawnee State Cross Country, and I am doing that to my fullest. We are fortunate to have such close access to a State Forest and a magnitude of great trails (note* one of my favorite trails was bulldozed and widened and not is not a top choice now, ADT trail). It is only about a 20 minute drive and there is instant access to many trail heads and over 120 miles of different trails. We can park at the main entrance under the lodge, at Pond Run Pond, at Camp OYO (pronounced O-Yi-O, I found out today), at Hangover, or any other crossing of a road and trail! There are unlimited options. For the most part the trails are cleared well. Last winter knocked a lot of trees over the trails, but the people out there seem to be getting to them now. I need to find out who does this and maybe lend them a hand sometime. Today Corey, Shane, and I parked at camp OYO and were going to run across the road on the orange blazed trails but as we were running there a few hunters were walking in. We thought best to not run where there were men with guns! So, we ran on the blue blazed trail. This was the first run on this part this year. It has some technical spots in it and it's the first time I have ran on technical trails in a while. I was a little off balance at times but overall felt pretty good. This is one of my favorite runs because it has several nice hills plus the technicality. I'm sure everyone I run with is tired of my talking about this but.... this trail passes through my favorite part of the forest; it winds through a short section of evergreen trees and for some reason I love it! Tomorrow Shane and I are going to drive out there and look around for some more trails. I have heard there is a nice trail at a place called Blue Ridge, so we are going to find it and check it out. I can't believe I went my entire freshman year without running out there (besides Hangover). One of my favorite places to be, even though these trails don't compare to trails out west. Today, I ran my last 2 hour run of the year (cross country year that is). The majority of my 2 hour runs have been out at Hangover, which is the best place to do it. But, when I was out there, I started to think about how many amazing runs I have had at Hangover. So, I thought I would go back into my log and my memory and write about some experiences I have had out there. These will not even include the time trials and races at Hangover, just long runs. - I didn't do any memorable long runs at Hangover until my sophomore year, when we decided to make a team goal to run a Hangover long runs on Sundays. Most of the team did not do these, but Keegan, BJ, Reece, and a few others had some great runs out there that season. Most of these long runs were in the dark and even though the footing was not good, the runs were awesome because night runs make it feel like you are floating. In late September, I wrote in my log about how Keegan fell. I remember this pretty clearly. Reece was down at the cars and Keegan, Shane, and I were finishing up a run down the hill. We were all making monkey calls to Reece. That was something we did last year. It was awesome. And as Keegan was making a call, he bit it and fell face first. Shane fell over him. After he got up and was alright it was a good laugh. - Another thing I remember was when Corey scared Keegan and me. It was really dark this time and Keegan and I were finishing up a long run, and right near the end, Corey jumped out of the weeds and scared the crap out of us. Embarrassingly I grabbed Keegan like a little kid! haha. I was not expecting that though. Just like Corey to do that. - Another nice run at Hangover was last winter with Reece. I can't remember when this was but I think it was after we all got back from Christmas break. Reece and I ran into each other at the school and decided to drive out to Hangover and run. This was one of the first snowy days we had. It started snowing as we were driving and by the time we finished our run, the roads were covered! It was awesome, snowy runs at Hangover are amazing. - This fall, I have ran 11 runs at Hangover on Sundays. 8 of those have been 15 miles or more and 5 have been 2 hours plus. I have started taking PowerGels during the linger ones and that is kind of cool. 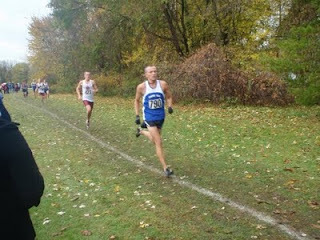 Before cross, Mike Cauley and Mike Sawicki joined some of us out there on two separate occasions. It is neat to show other people our training grounds and for them to brag about how hard it is. I take pride it it! So, Hangover is a key part of our training, and even more in my own training. I like to think that I have ran at Hangover more than anyone else, but I am not sure that I have. I probably have logged the most miles out there for sure! Hangover is different with the seasons and I have saw a lot of cool things out there. I look forward to more memories to come at Hangover. More runs will be ran this year there, just no more 2 hour runs. 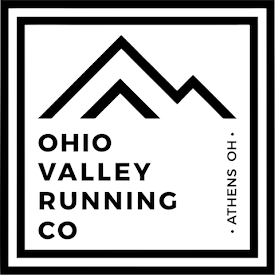 This winter, I am running a 30k in NC and I plan on getting some nice long runs in at Hangover. There is nothing like it! Thats right! We only have 35 more days, from today, until Nationals! That is 5 weeks! Wow, it doesn't seem possible for it to only be 5 weeks away but it is. The time has come. The season has flew by like I knew it would, and there are only 3 meets left. Aquinas, Conference, Nationals. . .
That is correct. Never got slower on any of these and continued to drop some time. Not a bad way to run a workout. It was nice to start out a little slower and ease into it instead of running 65 on the first on and then 75 on the last one. The workout was very effective and will make anyone mentally tougher. This week was also weirdly cold. Tuesday morning it was in the 60's when we did our morning run. Since that morning, I haven't felt anything above 50 degrees. Wednesday when Corey, Shane, and I went to the forest, it was a rainy 44 degrees! So, the workout was a great success. Did it on Spartan Stadium's track as well so not the best conditions. Finished the same on this, beside Corey with Linkous and Erock in front a little. That sent me into a great mood for the weekend. Saturday has not been as good. I wasted $5.50 on a bad movie: Where The Wild Things Are. I don't know why I let Wysocki convince me into watching this thing. I got home to find out Ohio State lost to Purdue! Could this be serious! The #7 team losing to the 1-5 Purdue! Wow. Pryor through 2 interceptions and fumbled twice as well. I think something needs to change. Anyways, the week has been great. I will finish up my week tomorrow with a nice 17 mile run out at Hangover. It will give me 92 for the week and then it is time to start dropping some mileage! Fourth meet of the year is done and over with. Seems like the season has flew by and it is already over half way over. Now, we only have Aquinas 2 weeks from now, Conference 4 weeks from now, and Nationals 4 weeks from now. How exciting. I need to cherish these last 6 weeks a little, because they are going to be something magical. Hopefully, this blog will serve as a nice reminder of all the great memories I have had this season and the many memories still to come. So, we had a good time on Friday night before the meet. Corey and I were roommates and we got to bed a little before midnight. I love staying at Hampton Inns; they have the best beds and pillows I have slept on. So, my nights rest was peaceful and full. Woke up, and it was Race Day! I shoved down my normal toasted bagel with honey and we loaded onto the bus for our trip to the course. The course was awesome. 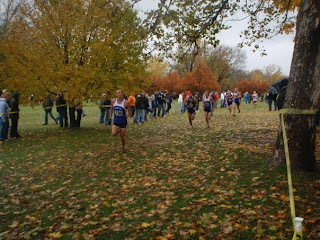 Terre Haute is the site for many Junior Championship, D1 National, and Pre-Nat races for cross country. It is basically a big field with a huge loop, with separate little loops for different distances. It rained the entire week leading up to the race, but the day of the race, it was sunny and dry. The course was still very wet, but there was no mud. The course had a basic drain system, but there were still a lot of standing water. The gun went off, and it was a fast start with about 30 teams racing for first. I established a decent position from the start. I was not in the top 10 though like I wanted to be. It was also different to have two Cedarville guys on both sides of me, but that soon changed. During the first mile, my guys got with me, about 6 other Bears were right with me. Sometime during the first mile I decided to try and get up with the first pack. I made a long surge and jumped about 20 spots to get on the rear end of the front pack. Even though no one from my team went with me, I think my move got my team moving. I went through the first mile at 5 flat and that was the last split I heard. 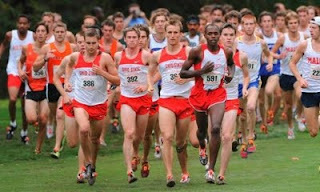 After the first mile, the rest of the team was up with me, Linkous went to the front 5 and Corey followed shortly. Shane and I were a few seconds back through 2 miles and we were looking good. Sometime during the 3rd mile, Linkous fell off the front pack and I pushed to help him out. I was leading the chase pack and started surging to get him. I caught him shortly after 5k and we were able to work together the rest of the race. Corey was still among the front 5 pack. During the race, a guy on the loud speaker gave race updates as the race went on. Shortly after everyone realized Shawnee State was controlling the race, the announcer started saying stuff like, "At 5k, looks like Shawnee State has 5 guys in the top 15 of the race." Then, 10 seconds later he would say, "Make that 8 guys in the top 25 for Shawnee State." It was awesome hearing this and it gave me more motivation. Also, near the end of the race, the announcer was announcing that Corey was challenging for the lead with another kid. That was the first race where I heard these kind of things over the loud speakers. I liked it! So, the race pretty much finished how it was at 5k. Corey had the lead with about 400 meters left but a kid from Wabash out kicked him. So, he finished 2nd overall. I had a lead on Linkous with a little bit to go but he got me down the last stretched, as did a couple other guys. Linkous finished 5th and I was 8th. The times were all around 26 flat, I was 26:08. So, the course ended up being a little slow with all of the water! Too bad because we were flying! Galen, Chuck, Hickey, Shane, and Joe finished 10, 11, 14, 16, and 22 respectively. As we crossed the finish line, the announcer said, "Looks like Shawnee already has their top 7 in and will be taking home the Gold!" Very uplifting. We won the meet and beat some nice teams. Purdue was the toughest team there, and we beat them by 32 points. We only scored 31 points! The less the better. We had a great day and still aren't satisfied. Two weeks from now we go to Aquinas where we look to get some fast times and run against a few top 10 ranked NAIA schools. It will be the first test against other NAIA schools. We have two weeks to prepare and get better. We are having a magical season so far, and it is going to end up magical. We are the Bears! And I am Michael Owen! Running Free! I still do not think we have realized how well we ran last Friday. Our attitudes have not changed, which is a good thing. I think two years ago if we would have finished 3rd at All-Ohio, our season would have been over because our heads would of blown up and we wouldn't be able to finish the season! This year, we are calm and collective in defeat and in victory. The time to celebrate is after Nationals, on Nov. 21st. This week has been a fairly easy week. The workout on Tuesday was really intense, but the other runs have been relaxed and calm. We did 4 sets of 1200's and 800's. We ran good times at the course and am sure this really helped. Yesterday, Shane, Corey, and I went out to the Forest for some soft running on the trails. This was a very good run, and was able to enjoy a nice cup of Pumpkin Pie Ice Cream! When we got back to the school we found out we were ranked 6th in the Nation in NAIA. This is the highest ranking we have ever been. Now, we have to prove our rank the rest of the year. We are on top, no coming from behind this year. I am looking forward to running at Terre Haute this Saturday. It will be our first overnight trip of the year. Overnight trips are always fun, hanging out with the team, relaxing, having a good time. The course is suppose to be fast so I am going to get out and run at the top of the race and see what will happen. Something good. I talked with my parents a couple nights ago. Sounds like they are making plans to had out to Washington to watch us run Nationals. That would be great if they can make it. The more support we have, the better we can be. Too bad Nationals is so far away this year, but the trip will be a great experience. This weekend was one to remember; my third trip to All Ohio. This course had been a nightmare for me the past two years. 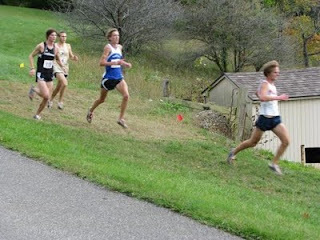 My freshman year, I ran 27:42, with temperatures in the high 80's! Last year, I ran slower, 27:47, and it was hot again. With the course already being the most difficult around, those conditions did not make it any better. And this year the conditions were no different. Rain every day a week prior to Friday had the course wet and muddy. But, I was ready, we were ready! How can we not of been when we were busting out workouts at Hangover in the pouring down rain!? I woke up on Friday expecting to run a little 2 mile shakeout run, but it was raining cats and dogs outside, so I decided it would not be worth getting wet and a chance of getting sick on the morning of the race! On our way to the race, we stopped at Bob Evans where enjoyed some multi-grain pancakes with very light syrup. This meal seemed to work really well for me in the past, so I went with it again because I knew my body would handle it. I got out to a really nice start. I was sitting with the leaders from the gun, in the top ten. There was mostly Ohio State guys, Malone guys, a few Cincy guys, and me up there. It was an awesome experience being up there only seeing 5 guys in front of me, especially here at All-Ohio, where my best finish was 63rd. I kept telling myself I belonged up there and that I could run with these guys. I came through the mile in 5:02; I was in 12th at that point. To give a little break down of the course: the first two miles are the easiest ones on the course. There are fewer hills, plus you are with more people. The third and fourth miles are very tough, with a lot a crippling hills. The last mile can be fast, unless you are completely dead. The finishes is a 300 meter flat stretch lined with the spectators, it is awesome. So, with all the mud, the ups and downs were slippery and soggy. The second mile was pretty relaxed. I ran with a few guys from Malone during this mile and Corey got up with me. I got passed by several people, but I was still holding my spot. I came through in 10:17, so a 5:15 second mile. I was in 17th place here. It was nice having Corey running with me, we never really ran beside each other but we were still able to work together in order to catch guys in front of us. This is when the work really started. The third mile has a couple good sized hills. Corey and I passed a few people because I was in 14th at the 3 mile, with a time of 15:55 (5:38), Corey was right beside me. At this point, it was nice knowing SSU was faring well because I saw Galen behind me on one of the turns and I knew without a doubt that Linkous and Shane were close to him. It was hard getting passed by people and it was hard passing people, because the mud was making it hard to get rolling. The fourth mile I was right in front of Corey at 21:42 (5:47), in 13th place. So, here I was, sitting in 13th place at All-Ohio, with a mile to left, working with my teammate, and feeling pretty good. Well, not good as in fresh, but I wasn't dying. Nothing happened during the fifth mile. It was pretty boring and it seemed to be over before it started! Bryce Wilson, from Rio Grande left me and Corey, and the Cincinnati guy that finished ahead of us was barely out of our reach. We tried for him down the stretch though. So, I finished 13th place! And Corey was .5 seconds behind me in 14th! Our time was 27:00.1 and 27:00.6! What was awesome about the finish was when Corey and I looked back, there was Galen, there was Shane, and there was Linkous, all within 34 seconds from us. Out top 5 really came in strong, Linkous was 26th, Shane was 22nd, Galen was 19th, and then Corey and I. After seeing this I knew we had to of finished 3rd place. Ohio State had 5 guys in the top 10. Malone had 2 guys in front of me and even though our 5th man finished before their 5th, they still beat us by 18 points. 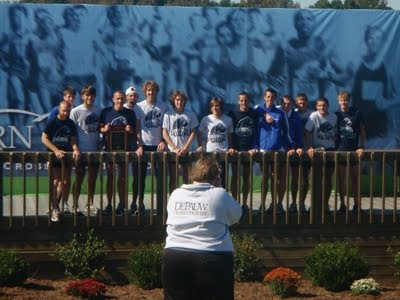 Shawnee State, 3rd place overall at All Ohio! We beat teams like Ohio, Cincinnati, ONU, and anyone else. Granted, Miami, Kent St., and Dayton didn't run, but still we performed and ran an amazing race. I could not have been any happier, celebrating this with my team! What a great race! It was also awesome having a nice supporting cast there. Blake Jones, Reece Brown, and Paul Webb were everywhere on the course! I had to see them like 15 times! The woman's team was also very supportive during the race. Cant forget my family as well. Both of my grandpa's came with my parents. They have my back in anything that I do and support me like no other. 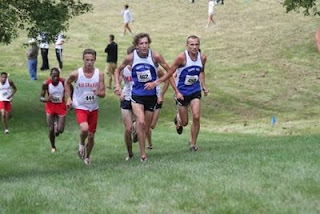 Tyler Kearns also rode up with them to experience his first cross country meet. I am glad we were able to give him a good one! I need to think about all of my fans and not take them for granted. They are really awesome. That night, Reece, Wysocki, and CC came over to my house and we did 1 hr and 40 minutes of Yoga X. Too bad Shane and Paul went home, or else they would have been there too. This was really intense, and soothing at time. Good bonding experience with the guys. Nice way to wrap up a great day! Saturday some of the team did a 100 minute run in town. This was a nice run because everyone was in good spirits and the weather was amazing. Today, Corey, Linkous, Hornick, Reece, and I went out to Hangover to run 12 miles. I felt really good. Got 85 miles in for the week, and I feel great. This upcoming week, we run at Terra Haute, Indiana. Time to get some fast racing in; I heard the course was amazing. We have to keep looking forward and working hard, because this season can be something huge. I am ready for it! I can't wait for everything! This week has produced the first comings of fall. Monday and Tuesday had highs in the mid 60's with a ton of wind. We did 6 x 1k's on the flood wall with a wall of wind hitting our face on the even numbered reps. That workout went real well, as we were clipping off sub 2:50 with the wind at our back and sub 3 with it in our face. Got some our legs rolling on some flat ground. Wednesday had a high of 55 and today I woke up with it being 40 degrees out! I think the temperature is suppose to go up next week but this week has been pretty cool. I like running in this type of weather, the air feels more crisp. Especially in the Forest yesterday when we ran up on the ridge. I sit here on my final day before our All-Ohio race, trying to keep my anxiety to a minimum. This anxiety is not the type of anxiety that something bad will happen or that I am scared. It is the type of of anxiety that has me feeling eager, ready to go! I feel like our team has put in a lot of work leading into this race, with hill workouts at Hangover and some shorter leg turnover workouts to compliment Hangover. Nothing but good can happen tomorrow. I am fully prepared to go in and upset some bigger teams and get a top 5 finish as a team. This is not a far fetched goal, because we can really finish top 5. We Bears just need to go run like we should. We are finally to a level that we have never been too as a team and now we need to run like we deserve it!